BALTIMORE -- Through the raindrops, the Phillies rallied for three runs in the sixth inning en route to a 4-1 interleague victory over the Baltimore Orioles at Camden Yards on Wednesday afternoon. Forty games into the season, the Phillies are eight games over .500 (24-16) for the first time since 2011, the last year they made the playoffs. The Phillies could wake up Thursday morning in St. Louis with a share of first place in the National League East, depending on the outcome of Wednesday night's game between the Atlanta Braves and Chicago Cubs. The Braves entered Wednesday leading the NL East by a game over the Phils. The Phillies' starting pitching continues to be brilliant. Nick Pivetta spun a gem Wednesday. He matched his career high with 11 strikeouts over seven innings of two-hit, one-walk ball. Over the last nine games, Phillies starting pitchers have given up just eight earned runs in 56 innings for an ERA of 1.29. The Phillies trailed 1-0 after Adam Jones, Baltimore's No. 2 hitter, took Pivetta deep over the center field wall in the first inning. Pivetta responded by retiring the next 12 batters in order. By keeping the game close, Pivetta gave his mates chances to solve Baltimore right-hander Andrew Cashner. Cesar Hernandez ignited the Phillies' three-run sixth with a leadoff homer to right. 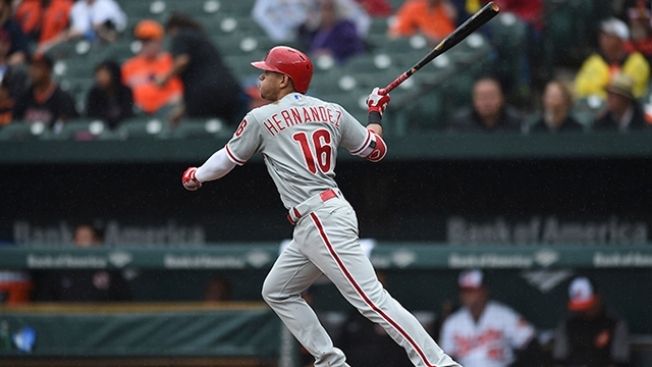 Carlos Santana kept the inning alive with a two-out walk and Nick Williams, Maikel Franco and Pedro Florimon followed with two-out singles in the rain to give the Phillies a 3-1 lead. Williams had a particularly good at-bat. He fell behind in the count, 0-2, before fouling off three pitches and taking a ball on his way to his important base hit. That brought up Franco. He had popped weakly to the pitcher with a runner in scoring position to end the fifth inning. This time, he sneaked a groundball through the right side to put the Phillies ahead. Franco leads the team with 29 RBIs. Florimon's RBI single capped the rally. An inning later, Hernandez tripled and scored on a hit by Rhys Hoskins. Things got a little tight in the bottom of the eighth inning when the Orioles loaded that bases with one out. Luis Garcia got out of the jam by retiring two big bats, Jones and Manny Machado, the majors' leading home run and RBI man. For the second straight game, manager Gabe Kapler went Edubray Ramos in the ninth. Ramos struck out Jonathan Schoop and Mark Trumbo for the first two outs. Kapler then brought in beleaguered Hector Neris to face left-hitting Chris Davis. The move was booed by some of the Phillies fans in the house. The boos turned to cheers when Neris got Davis to ground out to end the game. • Odubel Herrera, the majors' leading hitter, wasted no time increasing his on-base streak to 42 games. He singled in the first inning. • The Phillies open a four-game series against the Cardinals in St. Louis on Thursday night. Vince Velasquez (3-4, 5.05) starts the opener against Cardinals right-hander Luke Weaver (3-2, 4.91).